I got my main garden cleared out and I just pulled the weeds and tomatoes out of the tomato pots. I have planted some seeds and starts. Unfortunately the snails are still after the seedlings. But, I aim to preservere. My community garden partierre is weeded, I just have to amend it and add more fertilizer and keep weeding the rest of it. I planted some mesclun starts I had and cucumber, but the snails got all of the cucumber seedlings. The bush beans (contender) I planted a week ago are starting to germinate, hopefully the snails will leave them alone. The weeds have come back too. I am hoping I do this right this time. Earlier this year I planted everything at the same time and the Asian greens all matured at the same time. This time, I am trying to space things better so they don't mature in the same week. I am also trying to cut their numbers. I had way too many Cos romaine earlier this year and I did not thin them enough. 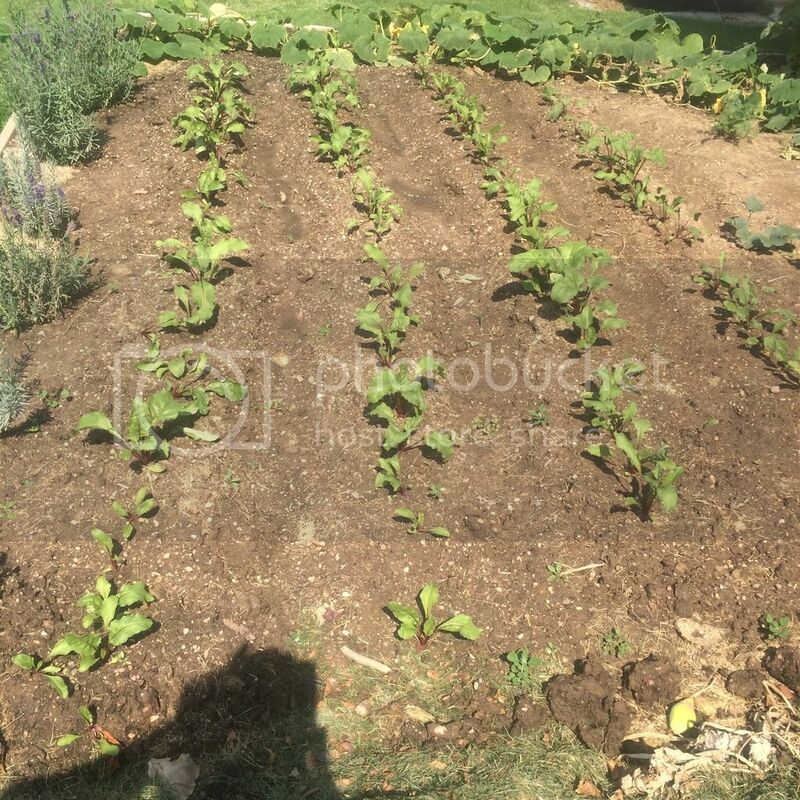 Beets, spinach, and a variety of lettuce are being planted in succession. I am expecting I may be losing a few more to the snails so I will probably have to replant a few things. Plant out the asparagus into the community garden when the weather cools. I started them from seed earlier in the year. Hopefully, these plans work out, but if not, I will keep trying until something works. Several other herbs that remain almost year round until a frost does them in. The tomatoes, cucumbers and peppers will survive until we get a couple nights of below freezing weather which is usually not until December, and some years, not at all in enough quantity or intensity to kill the plants overnight. I'm currently harvesting from a bounty of mature edamame that were started as early as possible in late spring. I sowed additional edamame after an early C.maxima sauash produced fruits and then was killed by SVB's. Those are growing nicely and I'm pretty sure will have chance to start blooming and set in the 60's night temp of late summer/early fall when they do best. Hoping they will have time enough to mature before frost. I sowed beets after harvesting garlic, and they sprouted, but the little seedlings have been disappearing. I'm pretty sure I sowed carrots there then, too but there are no signs. One of the fall crop I have been trying without success is fall peas. This year, when I used the spent spring pea vines as mulch, I purposefully left some of the fully mature and dried runty single pea pods on the vines. When I saw that they started to sprout, it was just after harvesting potatoes. So I sowed fast maturing bush type peas and somewhat later maturing pole type peas. (I think there probably isn't enough time left for the pole peas). Those sprouted last week. This week, carrots that I sowed in the same bed sprouted, too. 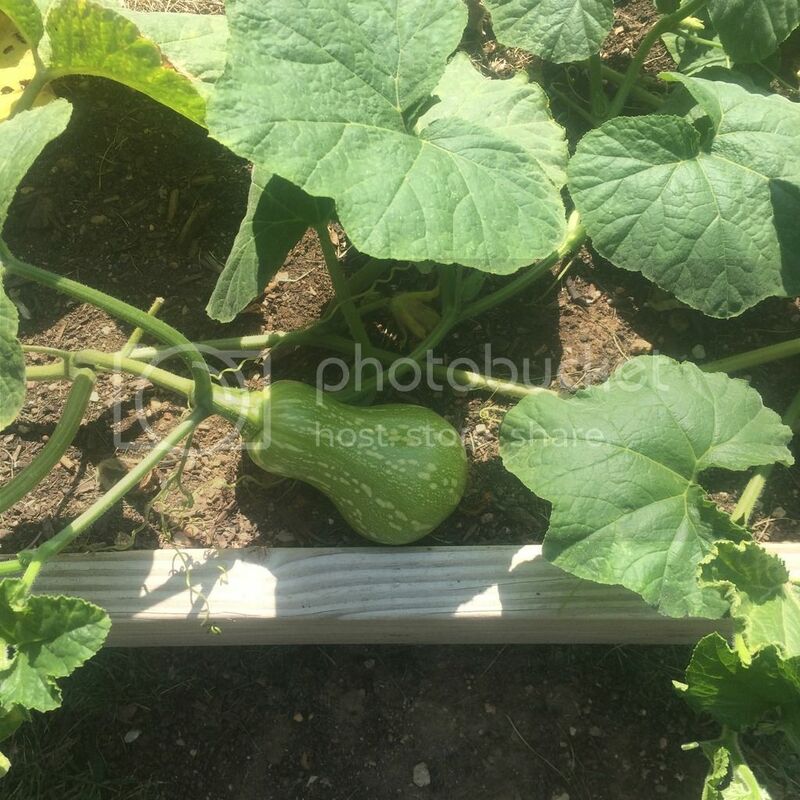 I also sowed some zucchini and crookneck summer squash since those were listed as 54? Days (something like that) -- they are up and already growing their first true leaf. I'm trying the same experiment in a large wooden container on the patio minus the summer squash. In another bed I sowed more peas and beets, carrots, and various greens -- lettuce, spinach, tatsoi... And a few pole beans. The pole beans and beets are up. There are volunteer red russian kale, tasoi, red chard, parsley, and root parsley everywhere where I let the spring and overwintered plants go to seed. Hopefully arugula, too, since I neglected to collect the seeds. I need to collect the seeds that are still left on some of the others for planting next spring. Brussels sprouts are struggling where I planted them, and spring-planted cauliflower that never headed up are still hanging on so I'm leaving them to grow and see if they will do anything this fall. I like Brussels sprouts and I keep trying them. I do get them to grow, but I have to start them in late summer because they can only produce in cool weather. The one I planted last year, I just pulled out. It grew and lasted under the citrus tree but did not produce any edible sprouts. Before I put them in my home garden which gets more sun and water and they did produce some small sprouts but they started opening up in the heat. Oh WOW! How would it be? Here we usually get a killing frost by September 10. That gives me 24 days of growing season left. +/- The only thing I will be planting this fall is the garlic, after the first killing frost and the garden is tilled. This year I have Brussels Sprouts (I started these indoors), Broccoli, Cabbage, lettuce, carrots, beets, and peas planted - but all on a small scale. Honestly I have little expectations... it is hit or miss. They will all survive frost but cold temperatures and 11 hour days with weak sun will stop any growth. Of course, I have peppers, eggplant, zucchini, and snap beans which will all produce until frost, and tomatoes barring blight, and the pumpkins and what's left of the winter squash to harvest. Had a few green bean seeds left over, thought I'd see if they have time to make it, they're up and running. (52 days to maturity) Also, bought a packet of grey zucchini, they're up. They're supposed to be ready in 45 days so we'll see. Theoretically they should just have time. Not sure what they average frost date is here, but in recent years with the heat, Nov. 1st or later has been typical. imafan26 wrote: I like Brussels sprouts and I keep trying them. I do get them to grow, but I have to start them in late summer because they can only produce in cool weather. The one I planted last year, I just pulled out. It grew and lasted under the citrus tree but did not produce any edible sprouts. Before I put them in my home garden which gets more sun and water and they did produce some small sprouts but they started opening up in the heat. Next time try planting a few Brussels Sprout plants and what I do. Wait until the sprouts start forming on the stems and do so on about 18 inches of it and then top the plant so more energy goes into making the sprouts larger and not the growth of the plant. Give this a shot to see if it works. You get more uniformly larger sprouts along the length of the stem. If you leave the tops continue growing, the bottom sprouts fill out and they get progressively smaller on the stems until they are almost pea size and just forming. Thanks Gumbo, I'll try that when the plants are tall enough. A lot of my plants will carry over like the eggplant, peppers, and many of the herbs. The ginger and taro will be harvested later in the year when the tops die down. Most of the citrus trees have fruit now but they aren't ripe yet. The calamondin is the exception, it has several batches of fruit a year so there is almost a constant supply. The bilimbi does have fruit now and the Brown Turkey fig has fruit most of the year. I don't have to worry about frosts, but with the shorter days plants will grow slower. Eggplant will usually not produce much in November-January. 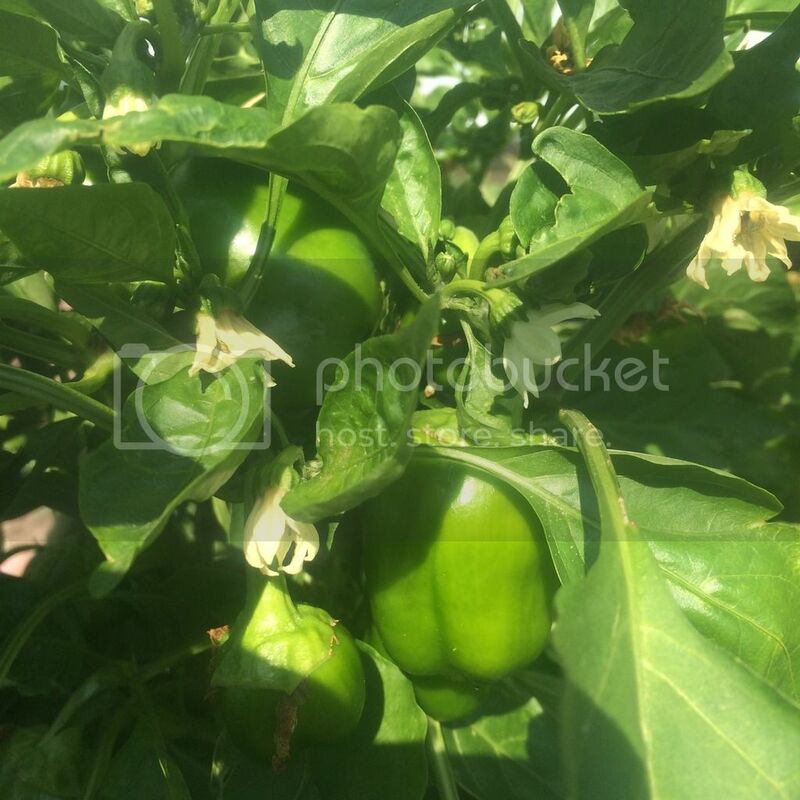 Peppers will produce a little but mostly will be fruit that is already set, they don't bloom much. It is a good time to plant cool weather crops since the day temperatures will be in the 70's and sometimes high 60's and the nights around 50. Cilantro can last more than a month and a half, broccoli will be good until May, lettuce won't bolt as quickly, and I can grow regular spinach instead of NZ hot weather spinach. My days will be about 11 hours. The longest day in summer is about 13 1/2. Only two hours separate them, but the winter sun is much milder and the air temps are much cooler allowing some plants to grow better, but the heat lovers like corn will barely do anything. Lettuce will take almost two months to mature where in Spring and early summer, lettuce is ready to harvest in 3 weeks. It is the best time of the year though to move plants. It is the best time for me to repot the orchids and move some of them out to more sun. The vanda will bloom once the plumeria drops its leaves and more light gets in. 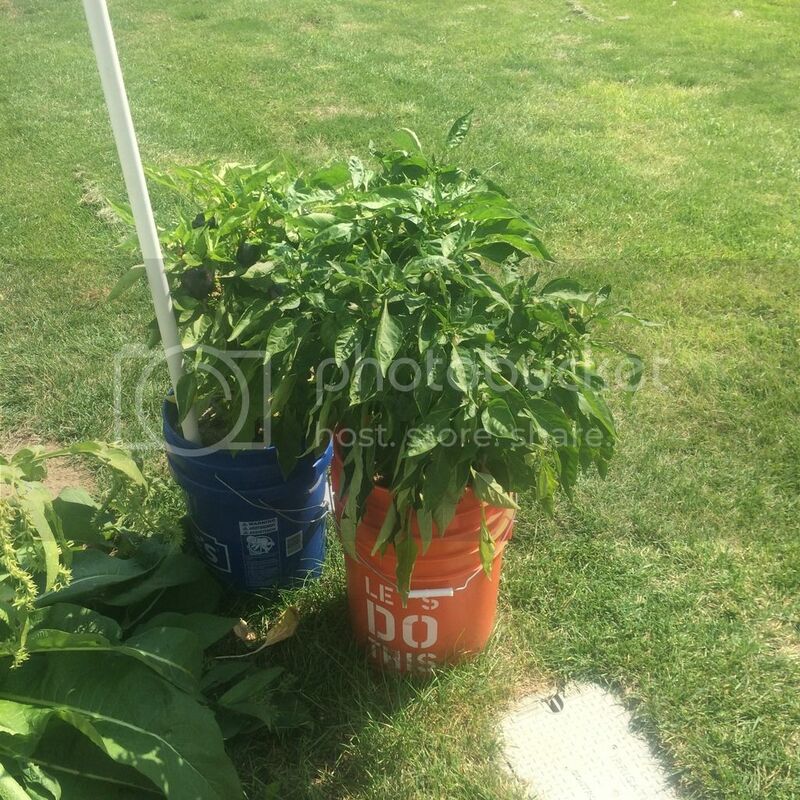 I will have to go and check out the end of season sales at the big box stores and stock up on supplies since it is hard to get planting media or pots once the stores start putting out the seasonal items. It is also the best time for me to move or plant roses and renovate the grass, since hopefully it will rain more. Although that is unlikely in an El Nino year. I just hope the storms keep missing us. It is never a question of if, just when another hurricane will hit and we are in most danger near the end of September when the Pacific High moves away. 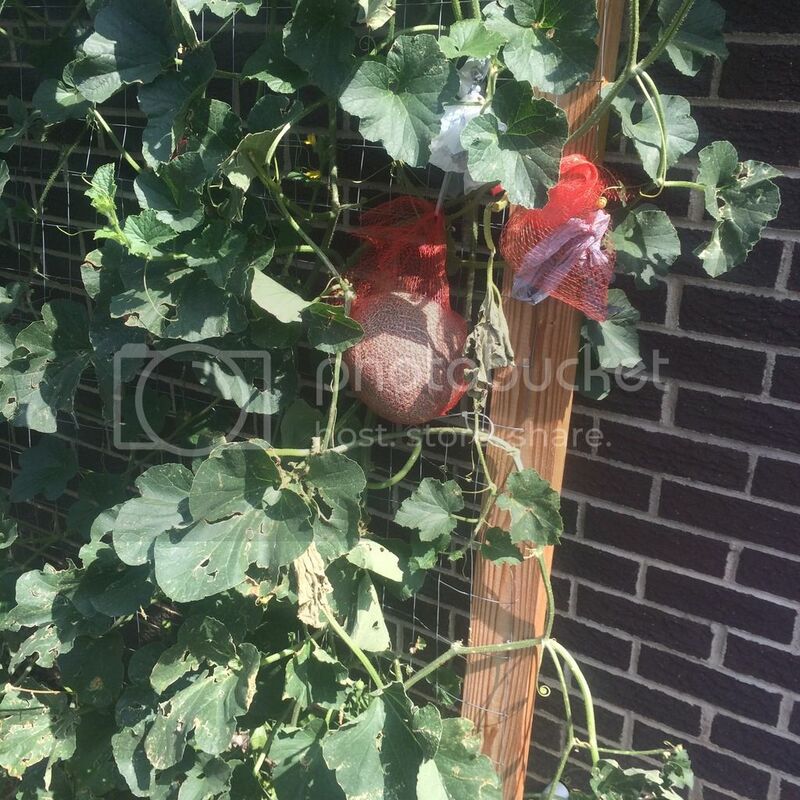 - Sweet potato vines have to be constantly directed away from this little patch where potatoes were harvested, loose soil raised into a mound and sown with carrots and greens as well as climbing peas along the fence. The peas are growing well into the vining like crazy stage, but the carrots are very very slow to develop. Maybe more fertilizer is needed and I may hoop cover the bed with plastic or fleece to warm up a bit as well as extend the season. - a snowpea pod on a new plant growing from the pods/seeds left on the peavine mulch looks like a success! Nothing fancy here....just what can grow reasonably well into November if the weather cooperates. Kale, collards, and lettuces. 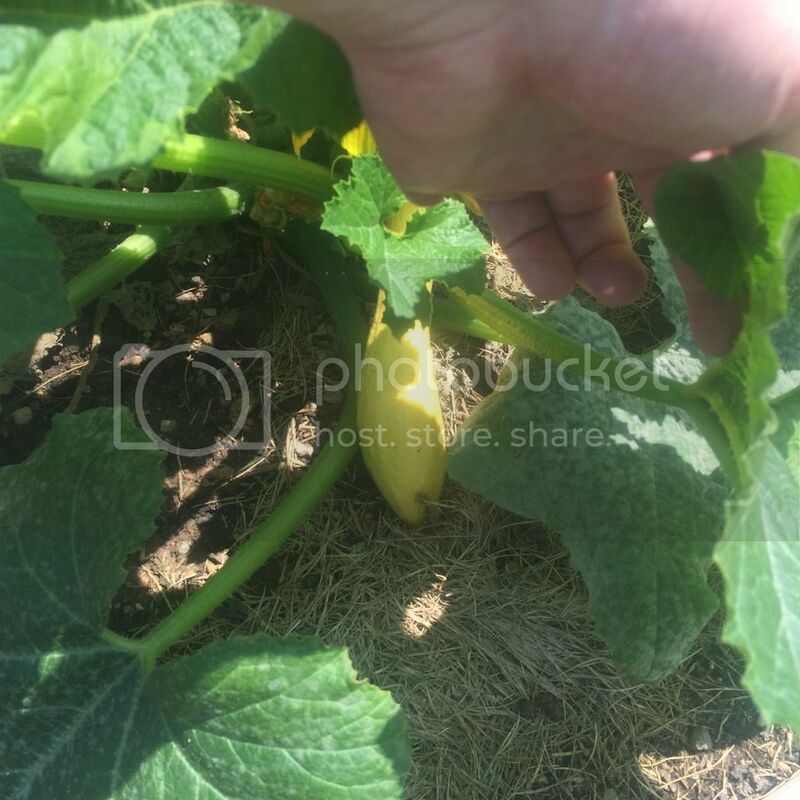 Zone 9A-I've got zukes coming up, asparagus beans are vining. Bell peppers from the spring are starting to produce madly again. Flowers on the tomatoes, jalapenos producing abundantly. 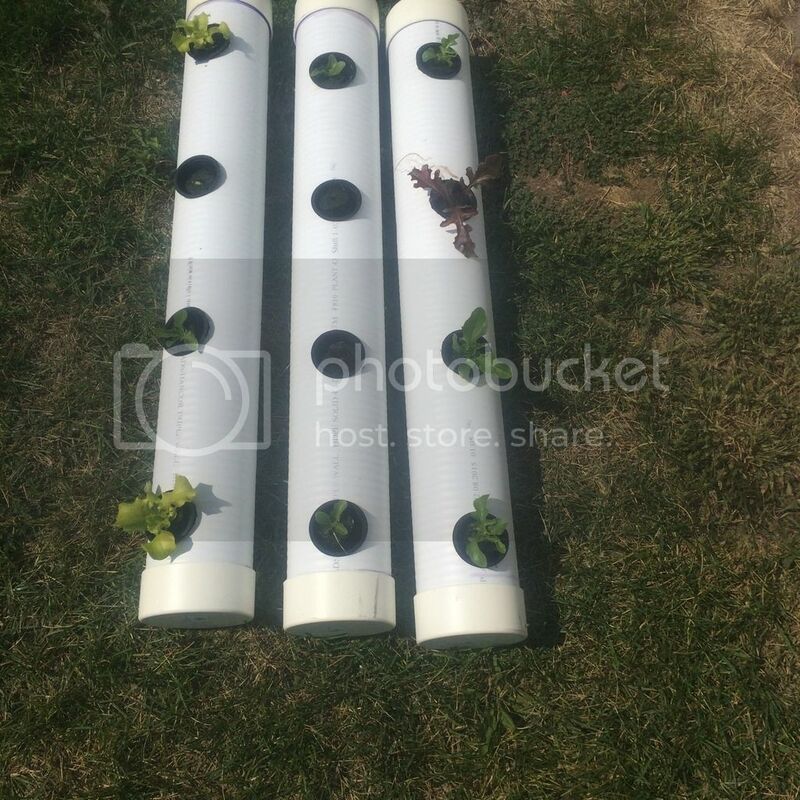 Just planted, bok choi, radish, spinach and lettuce. Will plant cabbage and broccoli sets as soon as the Ag center has their sale. My container peppers, which have really taken off this last couple weeks. I counted 20 fruit hanging on this plant this morning. 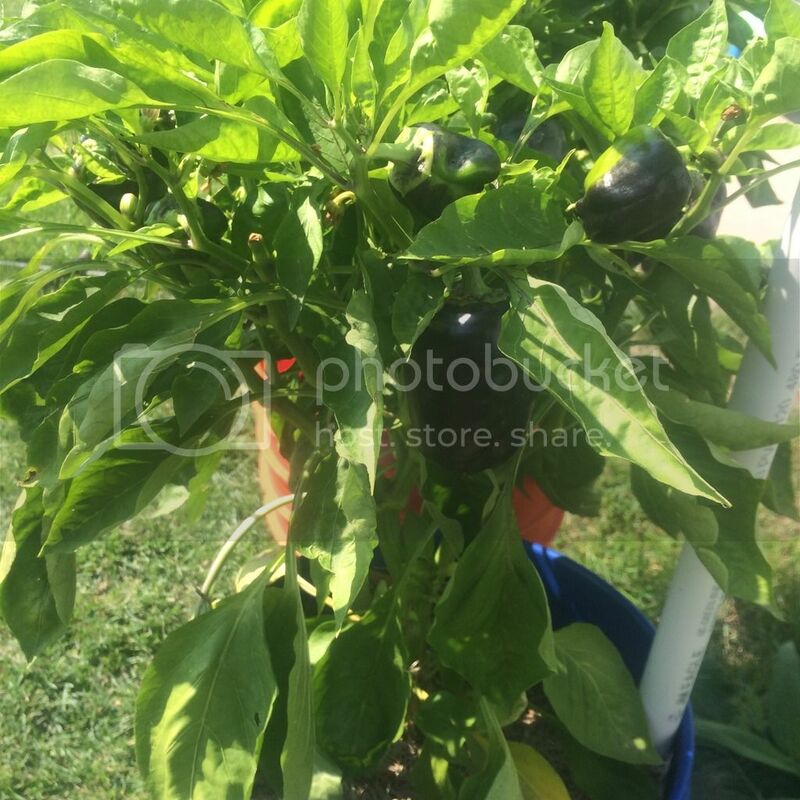 My little purple pepper has 10 fruit growing on it right now. And that's all I have left this year. Beets are growing. Should be ready by October. Butternut plants decided to try for more... I don't it will make the first frost, but you never know. And some cantaloupe still ripening. And a bunch of tomatoes. Can I still plant zucchini this late? Hmmm never tried. El Nino is supposed to extend our heat past October and unfortunately extend the Hurricane season as well. I have not tried to plant squash and zuccini this late, but it might be worth a try. A lot of rain coming now and my 'grass' is a sea of weeds. It is so hot an humid that I am sweating just sitting in front of the computer and when it rains, the rain is warm. I went snail hunting tonight when I went out after dark for green onions. It is damp and drizzling, and still hot, but I was surprised that I did not see more snails out. I did get one African snail on its way to munching on my beans. The only thing the snails don't seem to want are the daikon. They have no damage, but they have eaten yet another cucumber and now they are working on the beans. Fall planting now or later?